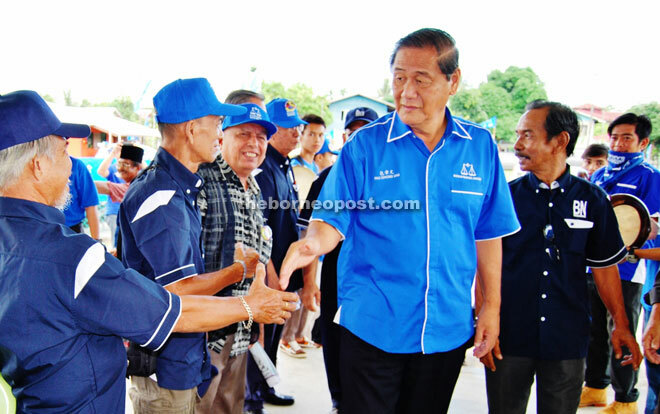 BINTULU: The slogan ‘Dare to Change’ of the DAP should open the eyes of constituents in Tanjong Batu to change their elected representative from DAP to BN. BN candidate for Tanjong Batu, Datuk Pau Chiong Ung, said the DAP had failed to serve the people of Kidurong (now renamed Tanjong Batu) well even though they had won the seat for three terms. Hence, he said, the voters must `dare to change’ and vote in the BN for a better tomorrow. “I hope voters in Tanjong Batu will give me their support,” he said at the ‘Jom Berambeh’ with local residents at Assyakirin Phase 1 Community Hall yesterday. Pau said former Kidurong assemblyman Chiew Chiu Sing was a good man and a friend, but he cannot do anything for the rakyat while representing the opposition. Pau’s capability in serving the community cannot be denied because he has been active on the ground the past 30 years. Meanwhile, PBB Kidurong chairman Haidar Khan Asghar Khan said the opposition was nifty in twisting facts. He said in the past 15 years, the DAP deputy chairman was only able to smile and shake hands without being able to do anything tangible for the people. He thus advised the constituents to vote in those who could work. Also present at the event were Kampung Assyakirin Phase 1 village chief Pengiran Hamdan Pengiran Kerta, community leaders and PBB Jepak veteran club members.